In the spring of 2009, both my husband and I experienced serious health challenges. We started conventional treatments, and in parallel, I started looking for natural ways to improve our health condition and boost our immune systems. During my research I found out about Hippocrates Health Institute in Florida, a place where many people have improved their health following a life-changing program. Their protocol included wheatgrass juices and green juices from sprouts. After completing the 3-week program at Hippocrates Health Institute, consisting of drinking the wheatgrass juice and the green juices every day, we implemented the program at home. Now, both of us still following the program, are in perfect health. Many of our family members, friends and colleagues wanted to try these juices for themselves, but could not always find the wheatgrass or the sprouts in the store. As a result of my husband and I trying to supply them, we started to grow more trays and have more orders. 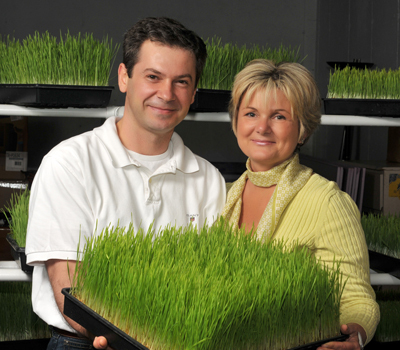 We also have had the honor to have Master Grower Michael Bergonzi, former director of the greenhouses of Optimum Health and Hippocrates Health Institutes, visiting us in MI and training us on how to grow the sweetest wheatgrass and sprouts. We hope that with our wheatgrass and sprouts we will be helping many people feel better, feel energized and experience this healthy lifestyle. We believe that, through our health challenges, God has given us the opportunity to help many others. Helping others is what we are trying to do.